Won't be long before the freezing temperatures , snow will be here for several months. Mostly missed winter in the coldest areas. Can some of the people with experience share their impressions, Techniques, problems ? This won't really be helpful in general, but since I drive about the same amount of miles every day that I can get from L1 charging overnight, leaving the car on the charger all the time starting with ~50% SOC achieves the goals you stated. People who got one when they first came out last winter might be able to relate how much energy they lost to conditioning, especially when unplugged. GM isn't saying so we'll have to track it ourselves. 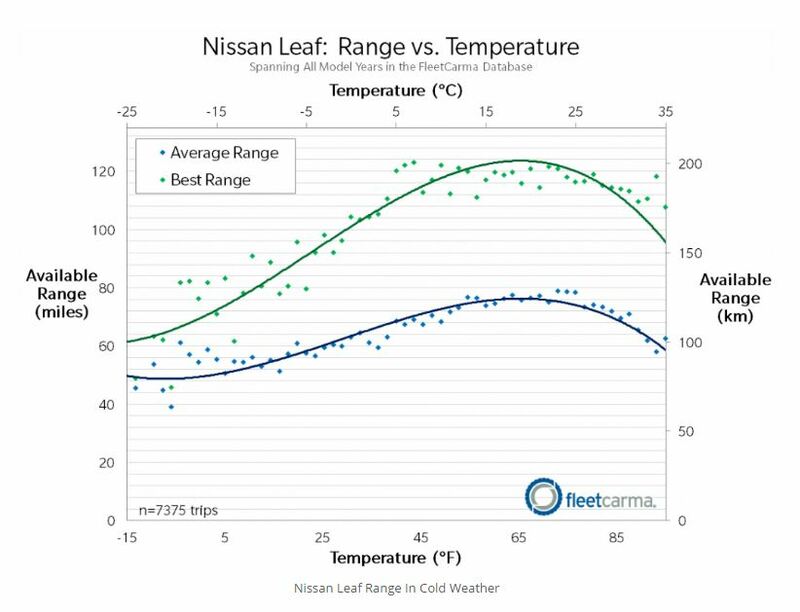 I went through five winters with the 24 kWh Leaf and it lost range to the cold but regained it when it warmed up again. It only warmed the battery if it was bitterly cold, -14 or so, not conditioning it like a Bolt. So Bolt should consume more energy unplugged in the cold, but it has a lot more to spare. GM recommends leaving it plugged in, but you probably wouldn't need to. I'd echo the last post. While there aren't a lot of us with experience driving a Bolt in the winter, there are a lot of with experience driving Leafs, Teslas, etc, in the winter. This will be my second winter driving my 28 kWh EV, and the drop in range is dramatic the colder it gets. No EV's range is immune to the cold. It stands to reason that the Bolt's range curve would be similarly affected by the cold. Let us know how it goes with your car. I expect a big hit in range. I am mostly interested in how much energy is used to keep the battery warm and ready. How long does it take to warm the battery from 20 degrees F.
I don't need to commute to work (retired) but want the car to be ready to drive if I need to run to town . My typical use of the vehicle may see it sit for severalunch days between use. Can leave the level 1 or level 2 charger connected, but don't want to leave the battery in a high SOC all winter. Does the conditioning work without charging? I am setup with off peak electric rates and a solar microgrid , so managing the energy required for conditioning and charging is challenging. Again, GM isn't giving us any specifics, but it appears that it will condition the pack wether it's plugged in or not. Over an eight hour shift, leaving it parked outside, unplugged at near zero Fahrenheit, I expect it'll consume a few kWh, but until we track it, or someone reports their experience from last winter, it's an unknown. In your case, not needing a lot of range very often, I don't think it'll ever be an issue. I wouldn't bother leaving it plugged in just for that. Again, worst case...in the coldest of conditions; you'll still get at least 120 miles of range. Not sure if that's enough for your "run to town" or not, but it sounds like you're not planning to put a lot of miles on your car, so it probably is. You've got a big battery, so you likely don't need to worry about it. If the car is going to sit for extended periods, you do want to avoid 100% SOC. Hilltop Reserve is recommended. All the standard winter EV techniques apply...if you're worried about range, pre-condition the car so the battery & cabin is warm before heading out. One other variable with cold weather consumption is how much cabin heat one uses. I do a 180 mile run in one day every 2-3 weeks but run to town is 20 mile round trip. Still had 88 miles of range . I got mine jan 9th 2017. Most of the winter. I drive 150~. Miles a day every day. In the ideal temperatures I got 230-235 a couple of time but mostly 220. 23 min are interstate driving at 82 mph. (Loose most mileage/ energy here) in winter it was mostly around 20 degrees but got to 0 a couple of times. It charged to 175-180 on average. The battery conditioning has only activated 4 times. ( first was on 18 wheeler when I had onstar active and tracking my car through Wyoming) I think too many people are worried about this when it just doesn't happen that often. Definitely not enough to drain the battery any significant amount. That my experience. Take it or leave it but it's real world experience. Love the car. Love electric cars. Any kind is better than none. Enjoy!